Species belonging to the potentially harmful diatom genus Pseudo-nitzschia, isolated from 16 localities (31 sampling events) in the coastal waters of south-eastern Australia, were examined. Clonal isolates were characterized by (i) light and transmission electron microscopy; (ii) phylogenies, based on sequencing of nuclear-encoded ribosomal deoxyribonucleic acid (rDNA) regions and, (iii) domoic acid (DA) production as measured by liquid chromatography-mass spectrometry (LC-MS/MS). Ten taxa were unequivocally confirmed as Pseudo-nitzschia americana, P. arenysensis, P. calliantha, P. cuspidata, P. fraudulenta, P. hasleana, P. micropora, P. multiseries, P. multistriata, and P. pungens. An updated taxonomic key for south-eastern Australian Pseudo-nitzschia is presented. 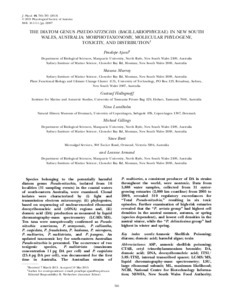 The occurrence of two toxigenic species, P. multistriata (maximum concentration 11 pg DA per cell) and P. cuspidata (25.4 pg DA per cell), was documented for the first time in Australia. The Australian strains of P. multiseries, a consistent producer of DA in strains throughout the world, were nontoxic. Data from 5,888 water samples, collected from 31 oyster-growing estuaries (2,000 km coastline) from 2005 to 2009, revealed 310 regulatory exceedances for "Total Pseudo-nitzschia," resulting in six toxic episodes. Further examination of high-risk estuaries revealed that the "P. seriata group" had highest cell densities in the austral summer, autumn, or spring (species dependent), and lowest cell densities in the austral winter, while the "P. delicatissima group" had highest in winter and spring. 漏 2013 Phycological Society of America.